Yunax Modern Furniture opens its first showroom on February 9th in Johnstown Business Park featuring well-crafted European designs. 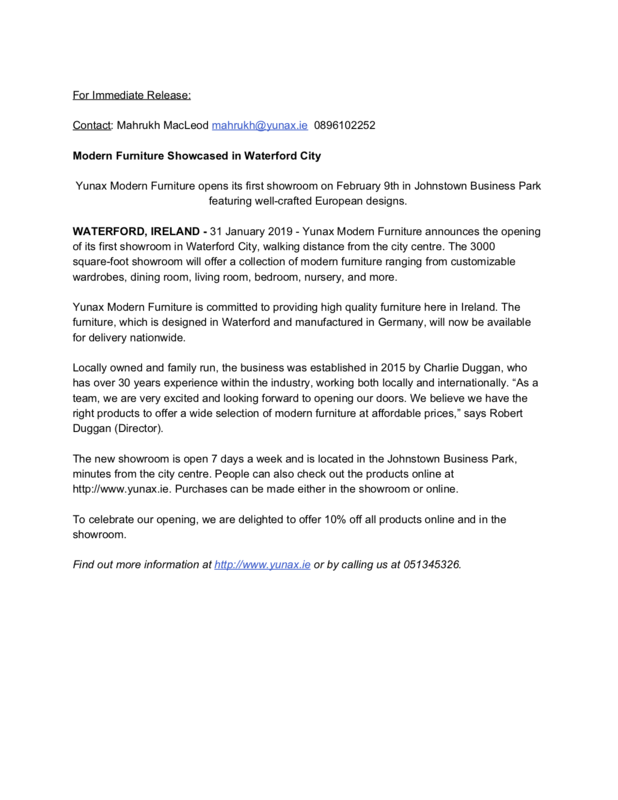 WATERFORD, IRELAND – ​31 January 2019 – Yunax Modern Furniture announces the opening of its first showroom in Waterford City, walking distance from the city centre. The 3000 square-foot showroom will offer a collection of modern furniture ranging from customizable wardrobes, dining room, living room, bedroom, nursery, and more. Yunax Modern Furniture is committed to providing high quality furniture here in Ireland. The furniture, which is designed in Waterford and manufactured in Germany, will now be available for delivery nationwide. Locally owned and family​ run, the business was established in 2015 by Charlie Duggan, who has over 30 years experience within the industry, working both locally and internationally. “As a team, we are very excited and looking forward to opening our doors. We believe we have the right products to offer​ a wide selection of modern furniture at affordable prices,” says Robert Duggan (Director). The new showroom is open 7 days a week and is located in the Johnstown Business Park, minutes from the city centre. People can also check out the products online at https://www.yunax.ie. Purchases can be made either in the showroom or online. To celebrate our opening, we are delighted to offer 10% off all products online and in the showroom. Find out more information at ​https://www.yunax.ie​ or by calling us at 051345326. This entry was posted in Announcements and tagged Yunax News.